Everyone wants a beautiful, healthy smile and everyone should have one. The orthodontist’s goal and our purpose at the Pannu Dental Care is to achieve this for every single patient. That means YOU! 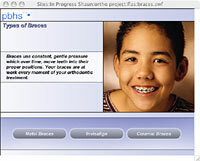 And yes, we provide state of the art technology and cutting-edge orthodontic resources at all times. This we provide to adults as well as children. For it’s never too late to align and fix your teeth and bite, and have yourself a perfect smile for the rest of your life! But worry not, we are gentle caring doctors and always sensitive to the needs of children and adolescents. They are very much a part of our specialty, too. Just like you! And our specialty is to design and apply orthodontic braces and devices that fit the individual needs of every patient. In no time at all crooked/crowded teeth, misalignment of the jaw or joints, poor facial development and other orthodontic problems will become a thing of the past. We will give you that beautiful, healthy smile you thought impossible to have. For at the Pannu Dental Care almost anything is possible! One of the reasons is because of the staff of fine dedicated people who work here. For we are indeed proud to continue serving the vast dental needs of San Jose, California, ,and the surrounding Bay area. And orthodontics is definitely one of the most important services we provide. Child or adult, no matter where you’re from or what you do, you truly do deserve a beautiful, healthy smile. Come visit us at the Pannu dental Care and let us show you how we will make it a reality for you. Dr. Pannu, our Invisalign expert is waiting to serve you. And consider it an honor and a privilege to do so. For a healthy mouth and jawline and set of properly aligned teeth can be yours. As well as that beautiful, healthy smile you’ve always dreamt of. So let the dream become reality. For the reality is real. And truly can be yours! We are here to make it so. Completely for you. Strong, beautifully-straight teeth and a beautiful, healthy smile that is permanently so!